The advent season is a time for excitement and anticipation. What could be more exciting than to enjoy a different treat made by a master chocolatier every day throughout December? Striking designs that stand out from the crowd are crucial in the fiercely competitive confectionery market; exceptional quality and complete sustainability are a must. Seasonal offers integrating high-quality messaging designs provide an opportunity to demonstrate the very best skills and expertise. Fabian Rimann’s advent calendar meets all these criteria with elegance and style; clear lines and a selection of the most stunning images of the peaks of the Swiss Alps create an impressive overall product. The clever bit: the calendar can simply be refilled as needed! 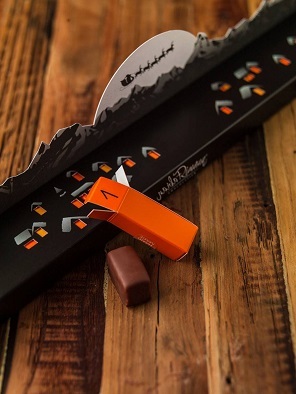 The project was commissioned by young Swiss chocolatier Fabian Rimann, developed by Swiss company Diprint AG and executed by Austrian offset printer Offsetdruckerei Schwarzach GmbH. Offset printing expert Schwarzach had already successfully deployed the bright white carton material Algro Design from Sappi for a range of other projects. The firm chose Algro Design in a 350 g/m² weight for the advent calendar. “This carton board keeps impressing us with its high level of whiteness and excellent converting properties,” explains Robert Keller, Marketing and Communications Director at Offsetdruckerei Schwarzach. The highlight of the subtle package is the elongated Swiss mountain panorama and the bright rising moon, in front of which five reindeer are pulling Santa across the night sky. Underneath are the snow-capped rooftops of small villages, with lights shining from the windows into the night, lending the scene a cosy atmosphere. The light effect was achieved through the stamped windows, perfectly showing off the individual yellow and orange chocolate wrappers. The advent calendar consists of a single piece, printed in corporate Rimann orange on the inside, and in black and grey with a slight gradient on the front. It was then given a matt dispersion coating before being stamped, folded, glued and laminated. The choice of carton demonstrates the overall impact on the final result of a bright white smooth surface, bending resistance, protective functions and deformation capability. Algro Design from Sappi is one of the most popular coated carton types on the market. The product range impresses with its extreme whiteness and consistent surface finish, which is ideally suited for the rendering of darker shades. Further benefits include very high light resistance and a silky-smooth touch, as well as its excellent converting properties for all commonly used finishing techniques. For Fabian Rimann’s many customers, the advent calendar has already proven its convenience– they keep refilling it with the award-winning chocolatier's tempting selection, from cream caramels with tonka beans to cherry brandy truffles and much more. Austrian offset printer Schwarzach offers lifestyle, quality and design on a sheet of carton. A well-established company with a strong tradition, Schwarzach produces environmentally-friendly packaging solutions for a wide variety of international consumer and luxury goods. About 350 staff look after the entire packaging workflow from development and print to finishing and logistics at the Schwarzach site, which boasts a production facility consisting of more than 50,000 m2. Offsetdruckerei Schwarzach manufactures folding boxes and labels for its customers and consumers in a modern production environment in compliance with the highest quality and environmental standards, with comprehensive certifications in those areas.